Cucumber Sandwiches! What an easy snack idea. It probably goes without saying that these are a breeze to put together. I mean, it’s hardly a recipe at all, but rather an idea. I say that because you can be a little versatile with this. You can use different varieties of cheese and sandwich meats. I also think these are good dipped in mustard, as well as sprinkled with spices (cracked black pepper, Montreal Steak Seasoning, etc.). There are a variety of options that still help to keep these babies low in calorie count, high in protein, and low in carbs. Whoohooo! For calorie counting purposes, I’m giving you the quantities for one serving. However, you can easily punch out a bunch of these . . . . . say, for after-school snacks or any other purpose you may find a need to sneak these into your household. 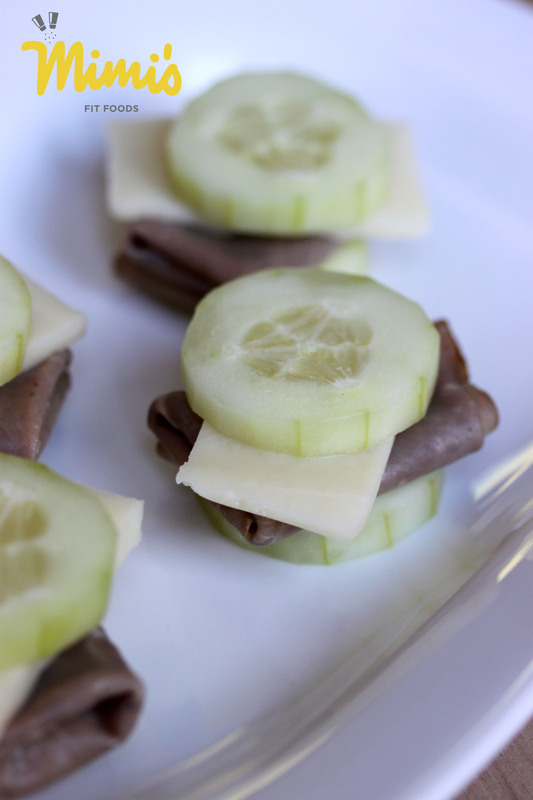 Take one slice of cucumber and top with a slice of cheese and 1/4 ounce of roast beef. Top with another cucumber slice. Repeat with remaining cucumber slices, cheese, and roast beef.